For some reason crafting a giant cardboard box model of DUMBO looks so fun! Join the DUMBO BID at 68 Jay St. to help cut and paste. 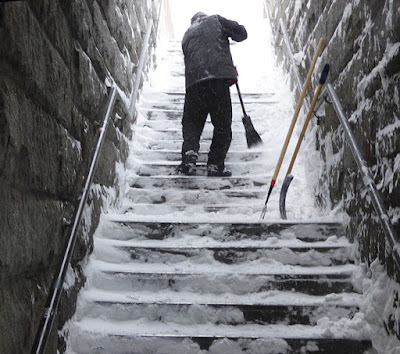 Following this weekend's blizzard, roughly 600 Brooklyn Con Edison customers were without power as of 5 p.m. Tuesday. 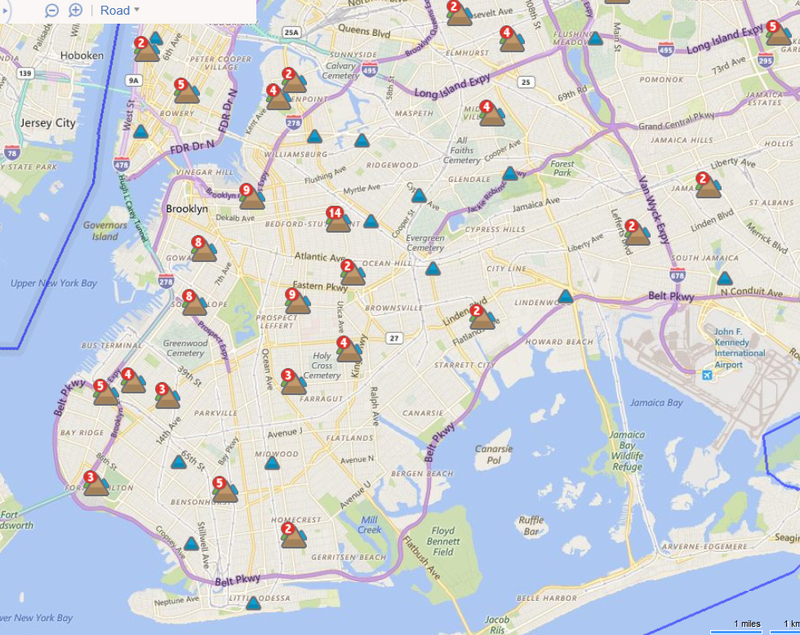 According to Con Ed's outage map, the dead spots were scattered across the borough, with Central Brooklyn registering slightly more outages. Most notably, 115 customers (individual units or homes) were without power in Prospect Lefferts Gardens; 58 in the South Slope; 34 near Eastern Parkway; 67 in Bed-Stuy; 25 in Homecrest; 36 in Ridgewood; 17 near the Navy Yard, 22 in Boerum Hill and more. About 300 customers lacked power in Upper Manhattan; 100 customers in Queens were also in the dark Tuesday evening. Depending on the location, Con Ed says many of these repairs will be completed either by 11 p.m. tonight or early tomorrow morning. It's cold up here! So McBrooklyn's heading south for a week. We'll catch up as soon as we get back! What's next -- flying pigs? 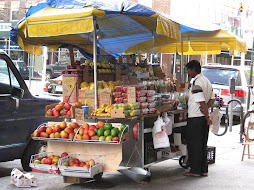 Cooperators at Whitman Owner (75 Henry Street) in Brooklyn Heights turned down a developer's $130 million offer to buy a strip of shops along Pineapple Walk to build a 40-story tower, the Brooklyn Eagle reports. The developer had dangled the promise of from $120,000 to $200,000+ per Whitman shareholder, plus enriched coffers for the co-op and the use of the new building's amenities. 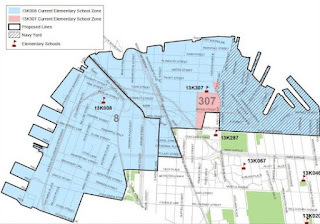 Here's the kicker: After much discussion about seriously overcrowded schools, subways and traffic (with many developments still to come) in Brooklyn Heights . . . shareholders turned down the developer's offer! Do things like this even happen in real life? We're not in town right now but if we were we would rush so fast to see this "Marie Antoinette-inspired bar" under Atlantic Ave.
"Le Boudoir" is meant to resemble the French Queen's "lavish lair" at Versailles. The drink menu is replete with hints of 1793, including absinthe. Tarek Debira and Patricia Ageheim, the husband and wife duo behind beloved neighborhood French restaurant Chez Moi in Brooklyn Heights, with partner Ali Mardassi, open Le Boudoir (135 Atlantic Ave, Brooklyn, NY 11201, 347-227-8337, www.chezmoiny.com), an underground Rococo-style 75-seat bar inspired by Marie Antoinette. Le Boudoir draws inspiration from the Queen of France's private chambers in Le Chateau de Versailles, channeling a space that once served as her refuge from the etiquette of the royal court, reserved only for her most intimate circle of friends. Debira, Ageheim and Mardassi introduce Brooklyn to their modern version of the lavish lair complete with an expertly crafted beverage program and light bites. From Beverage Director Franky Marshall, formerly of Monkey Bar and The Dead Rabbit, Le Boudoir offers an inspired cocktail menu that features imaginative takes on classic libations as well as unique signature offerings, both of which showcase unexpected spirits and liqueurs. All named as an homage to Antoinette, cocktail highlights include the 1793 with Toasted Sunflower Seed Infused Rye, Oloroso Sherry and Demerara; a French 75 with Cognac, Sparkling Wine, and Fresh Lemon; the Axel von Fersen with Applejack, Bourbon, Sesame, Curry and Black Caraway; Dauphin with Absinthe, Chile Liqueur, Almond Milk, Coconut, and Cacao Nibs; and the Guillotine with Mezcal, Scotch, Banana and Honey, among others. The bar boasts an extensive selection of spirits, including absinthes, whiskies, and French fortified wines, as well as lesser-known spirits like sotol. Bottled and draft beers are also available, in addition to sparkling, white and red wine by the glass and bottle. Le Boudoir will also offer a menu of Les Petits Pleasures including Crispy Frog Legs; Croquettes with Truffled Mushrooms; Country Pâté with Cornichons; a plate of Fromages; French Fries with Garlic and Parmesan; as well as Desserts like Chocolate Mousse and Crème Brûlée. Designed by the Chez Moi team, Le Boudoir takes its cue from the Rococo architectural and design movements of 18th century France. Hidden in Chez Moi is a replication of the bookshelf from Marie Antoinette's library, through which guests are invited to make their way to the secret entrance and down a flight of stairs to the underground bar area. The entrance reveals a marblebar, stocked with silver-plated goblets and coupes, crystal d'arcques glassware and features a small bronze bust of Antoinette that serves as the tap for beers on draft. Adjacent to the bar sits a Steinway Piano and plush tufted red velvet chaise lounge. In front of the bar is the intimate lounge area, with opulent red velvet banquettes and white marble tables, beneath a wall lined with ornate gilded mirrors and antique sconces sourced from French châteaus. A geometric wood ceiling is a reproduction of the Parquet de Versailles, a flooring pattern first introduced at the royal palace. Toward the rear of the room lies a dimly lit stone grotto, an abandoned tunnel uncovered underneath Atlantic Avenue during construction. The grotto is outfitted with a brown leather banquette, whimsical glass-top tables, all set beneath French Neo-Classical paintings. Marie Antoinette's spirit lives on at Le Boudoir in everything from the bathrooms that were designed as an exact replica of her private powder room, to an original engraved doorknob from her bedroom. Le Boudoir is open seven days a week from 6:00pm until 1:00am Sunday through Thursday and from 6:00pm until 4:00am on Friday and Saturday. Reservations are available via phone at 347-227-8337, or online at www.chezmoiny.com. Gov. Andrew Cuomo’s State of the State Address on Jan. 13 was "like Albany’s version of the Super Bowl," reports the Brooklyn Eagle -- with parties and receptions surrounding the big event. Parties thrown by City & State, the Brooklyn Eagle, the Queens Tribune, Carl Heastie and Thomas DiNapoli,among others, attracted large crowds. Because the people's business is hard work. 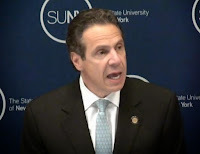 Cuomo at a 2014 SUNY meeting. Gov. 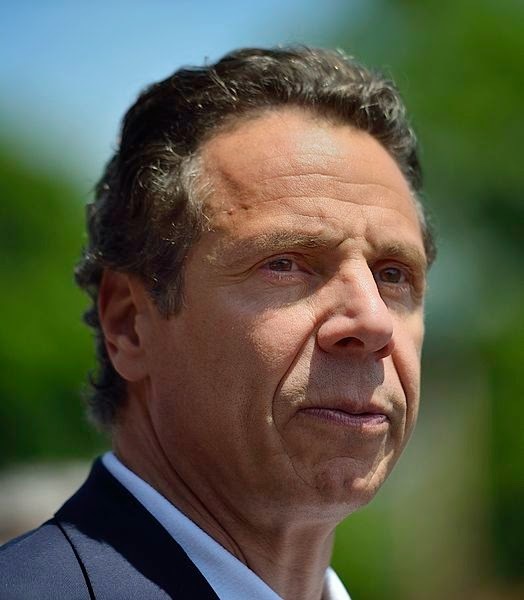 Cuomo is paying back city residents for voting him into office. The budget Gov. Andrew Cuomo unveiled on Wednesday will likely deal serious damage to New York City's bottom line for years to come, budget analysts told Politico. Cuomo's changes will likely cut close to $1 billion from the city’s budget starting in fiscal year 2017. “For New York City, I think this is one of the worst budgets that it’s seen in a long time,” said Maria Doulis, a budget analyst at the Citizens’ Budget Commission. Also: Highlights of budget at Syracuse.com. Yes, "cattoos" are a thing now. In Brooklyn. Here's the video that got more than 5.8 million views on Facebook before it was blocked. It shows a New York strap-hanger literally giving the shirt off his back to a shivering homeless guy on the A train. More details at the Daily News. According to the Twitter account NYC Scanner, two people were shot at 458 Columbia St. in Red Hook late Sunday/ early Monday. One was pronounced dead at an unnamed hospital. This address corresponds to the Hook West housing project. 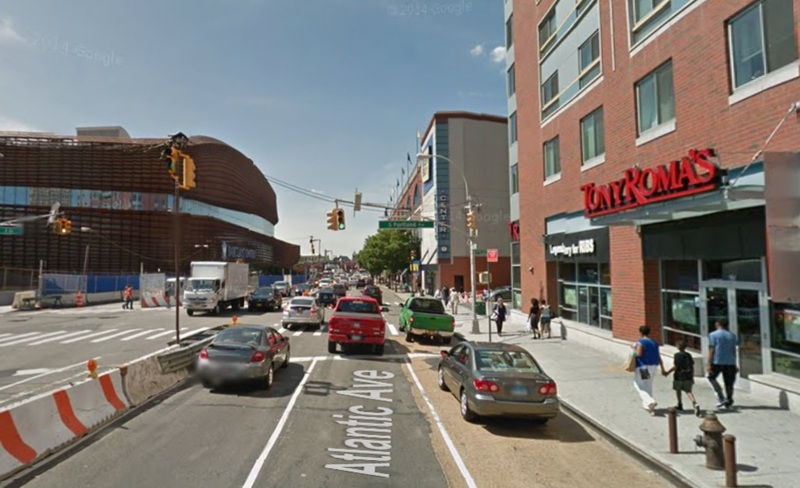 Voice: Barclays Center an 'Epic Train Wreck'? Neil Demause for the Village Voice says the Brooklyn real estate debacle known as Barclays Center is a money-loser that hasn't brought any new businesses or housing to the area that wouldn't have come there anyway. 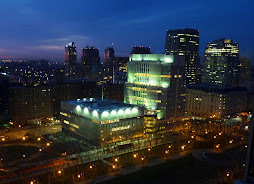 (Demaus credits Atlantic Yards Report blogger Norman Oder with digging out the financials.) Ratner recently sold his last bit of Barclays to Russian billionaire Mikhail Prokhorov. Demause says, "As for Brooklyn residents, we now have a terrible basketball team to watch, and a pretty decent hockey team, and a garish arena and some growing housing towers on a site that otherwise would probably have something similar anyway, given that pretty much every possible site in Brooklyn now has a ginormous apartment building going up on it..."
He ends, "It’s probably too simplistic to say of the Brooklyn arena that everybody ended up a loser, but we certainly haven't seen any slam-dunk winners yet. So for now, man, is this turning out to be an epic train wreck, or what?" The 2016 No Pants Subway Ride attracted thousands of pant-less riders on Sunday. Some participants, such as Spider-man, above, showed a little comic imagination. Other folks stuck to the pants-off script, or went above and beyond the call of duty, like no-pants no-shirt guy above. The event is hosted by Improv Everywhere. According to the group (theme: "We cause scenes. "), 4,000 riders participated this year. 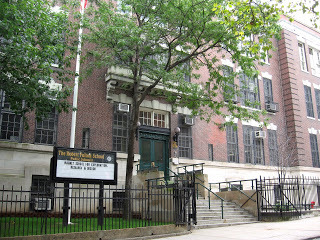 The District 13 CEC approved on Tuesday night the rezoning of P.S. 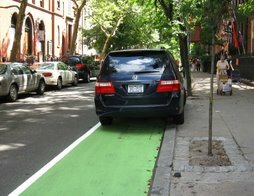 8 in Brooklyn Heights and P.S. 307 in Vinegar Hill. Kids living in DUMBO and Vinegar Hill will now be going to P.S. 307, rather than P.S. 8. For more details, visit Patch's blow-by-blow live blog of the hearing. 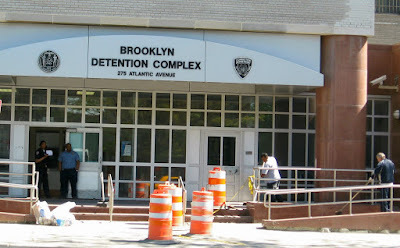 Violence at Brooklyn House of Detention on Atlantic Ave.
Two inmates were stabbed in the stomach and an officer was punched in the head hours after correction officers found three blades inside the Brooklyn House of Detention at 275 Atlantic Avenue, according to the Daily News. 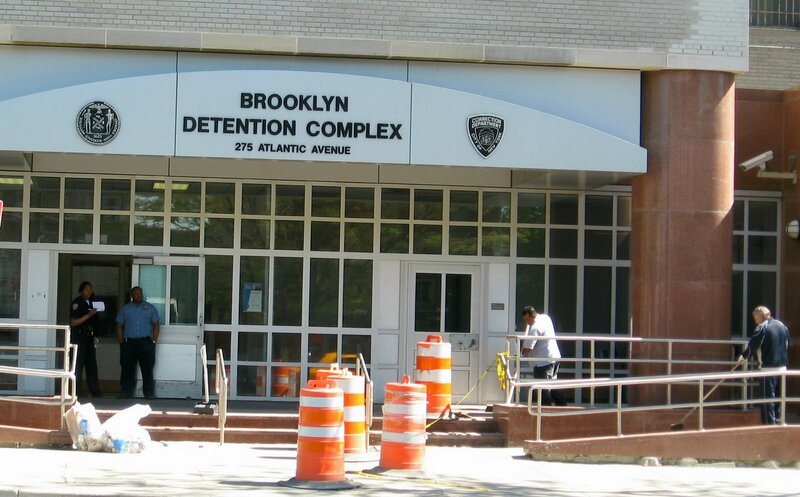 The Brooklyn jail has been called "a hotspot for violence" since last year, the News says. 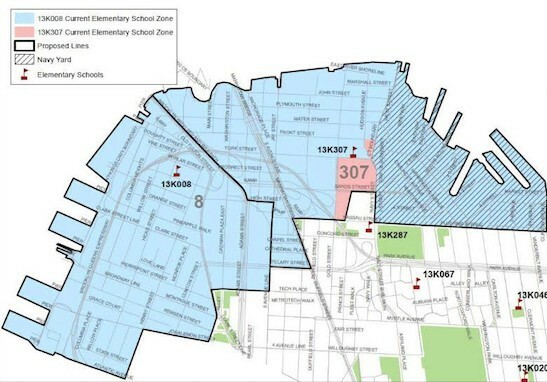 The District 13 Community Education Council (CEC) will vote on the proposed rezoning of P.S. 8 in Brooklyn Heights, and P.S. 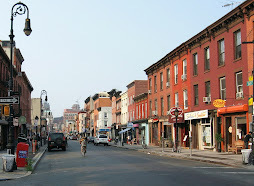 307 in Vinegar Hill, at a special meeting tonight at 6:30 p.m.
P.S. 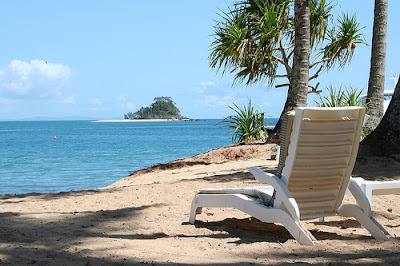 8 is overcrowded, while P.S. 307 is undersubscribed. According to the Brooklyn Eagle, the P.S. 8 PTA supports the rezoning, calling it "the only plan on the table to address the problem in time for the 2016-17 school year." On Saturday, January 9, or Sunday, January 10, 10 a.m. to 2 p.m., bring your tree to the Third Street entrance of Prospect Park or the Park Circle entrance at Parkside Avenue and Prospect Park Southwest, and it will be turned into environment-friendly ground cover. You can take home free mulch for your own garden. While you wait for your mulch, you can enjoy hot chocolate, served by the Park Slope Civic Council or become a Civic Council member. Can't make it? If you live in the area bounded by Union Street, Sixth Avenue, 15th Street, and Prospect Park West, you can leave your tree at either end of your block before 11 a.m. on Saturday and volunteers will pick it up and bring it to the 3rd Street entrance of the Park. To volunteer, e-mail the Civic Council's Sustainability Committee, sustainability@parkslopeciviccouncil.org or come to the Third Street entrance of the Park. MulchFest is co-sponsored by the Park Slope Civic Council in partnership with the Prospect Park Alliance, with special help from 1-800 Mr. Rubbish and U-Haul. 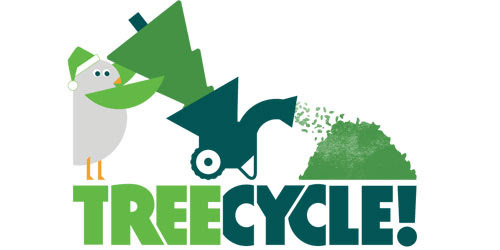 Update 2: If you can't make it to MulchFest, the Department of Sanitation will begin its annual Christmas tree curbside collection program from Monday, January 4 through Friday, January 15. Clean, non-bagged Christmas trees left on the curb will be chipped, mixed with leaves, and recycled into rich compost for the city’s parks, institutions, and community gardens. Cops were dispatched at 12:40 a.m. Sunday morning to Tony Roma's Restaurant at 673 Atlantic Ave., catty-corner from Barclays Center in Brooklyn, to investigate a complaint about a male with a firearm. According to the dispatcher, the gunman had been inside the restaurant but then left the scene. Dispatch said that the restaurant manager was currently holding the gun, and someone might be bleeding. (This has not yet been confirmed.) The perp fled East along Atlantic Ave. in a white sedan. The gunman was described as black, wearing a dark hoodie and dark jeans. Shortly after this assignment, another call came in reporting a "big commotion," a "dangerous condition" and a crowd at that location. 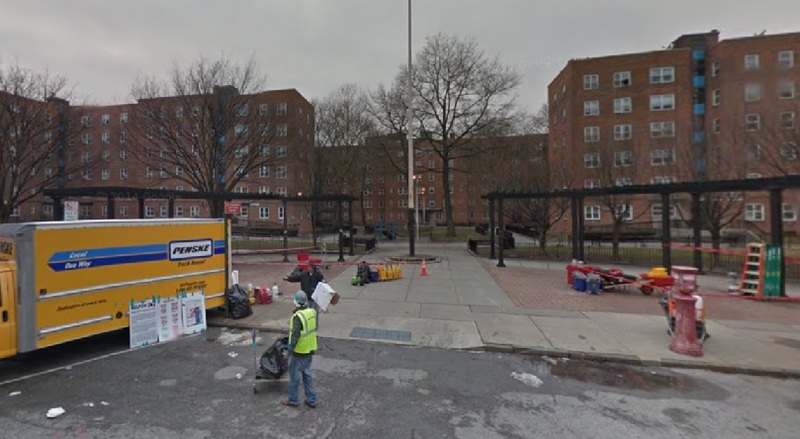 The 78th Precinct transferred this to the 88th Precinct, according to dispatch.